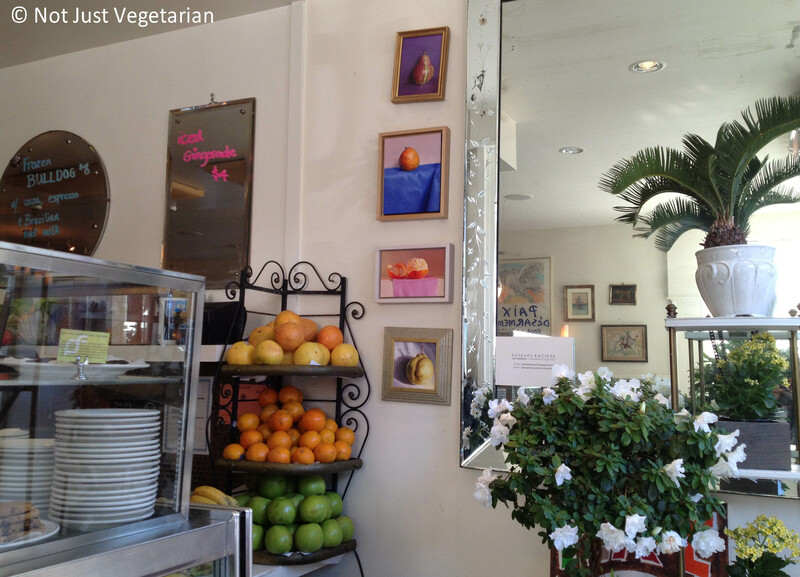 Another top contender for the best vegan in NYC is Peacefood Cafe. It has been on my list of places to check out for at least a couple of years now. I made it there last week and have happy news for you. I love the feel of this cafe. It is very bright and nice inside, the hostess and the wait staff are universally nice. Peacefood Cafe is a great place to meet a friend over lunch or dinner or to enjoy a delicious vegan / vegetarian meal by yourself. With so many choices on the menu we found it extremely challenging to choose a few dishes. We were also intrigued by a few dishes on the menu – e.g., raw pizza made of buckwheat, sweet potato and flax seed; and chick pea fries. We were unaware of the generous portion sizes of the dishes served at this restaurant, so after much consideration, we got a green lemonade, a tamale, chickpea fries, a mediterranean style panini, and a roasted potato pizza for the two of us. This was too much food for two of us and we ended up taking most of it home. My friend got the green lemonade. I took a sip or two and loved it for being so refreshing and sweet tart. 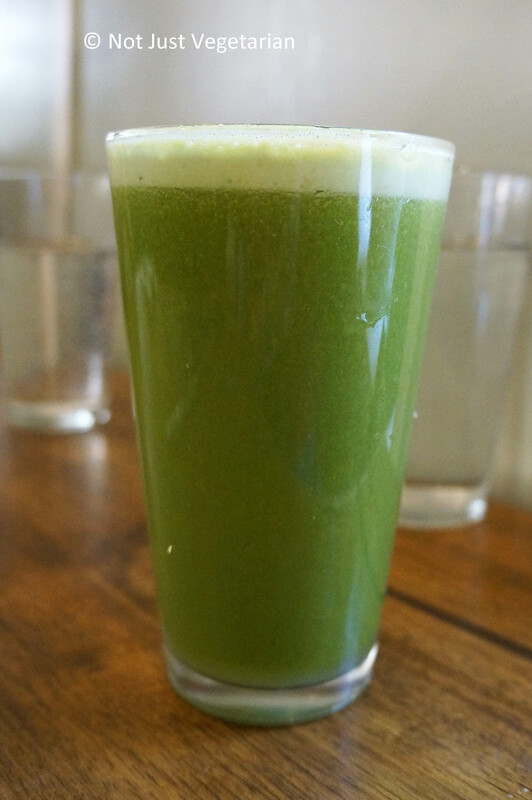 The apple, lemon, ginger, and mixed greens were a fantastic combination. I loved it because it had just the right amount of mixed greens to not overwhelm the palate, and allowed the flavors of apple, lemon and ginger to come through. 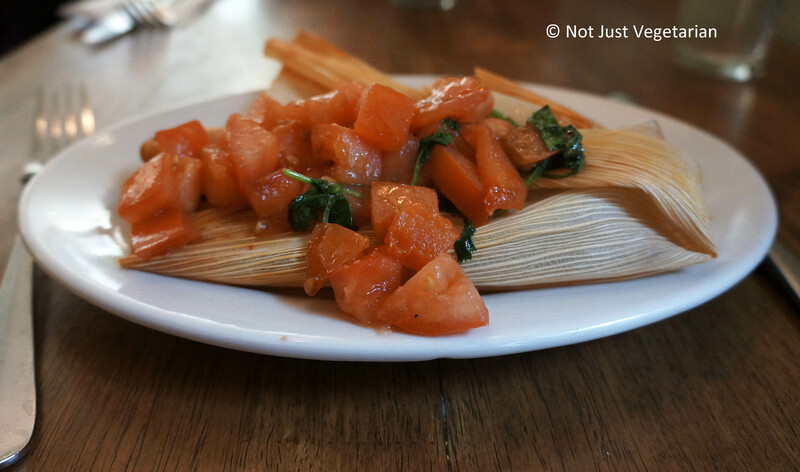 The filing in the vegetable tamale was simply delicious. There were sautéed onions, zucchini slices, tomatoes in a smoky chipotle (or was it pimenton?) powder and in cilantro oil. The tamale arrived with diced tomatoes and some cilantro on top. This is a must-order dish at Peacefood Cafe. The tamale dough was bland where it was thick, but was flavorful where it was thin. The diced (raw) tomatoes and cilantro on top added a boost of flavor. 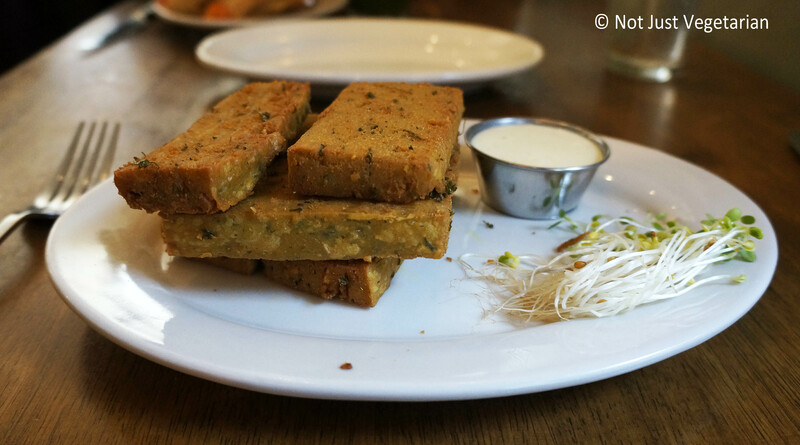 The chickpea fries were slabs of spiced chick pea flour / dough and deep-fried. We did not know what to expect. These fries were crispy on the outside and soft inside – a wonderful texture. The dipping sauce felt like it had some tahini in it, but not sure what went into it. I loved this savory dish. 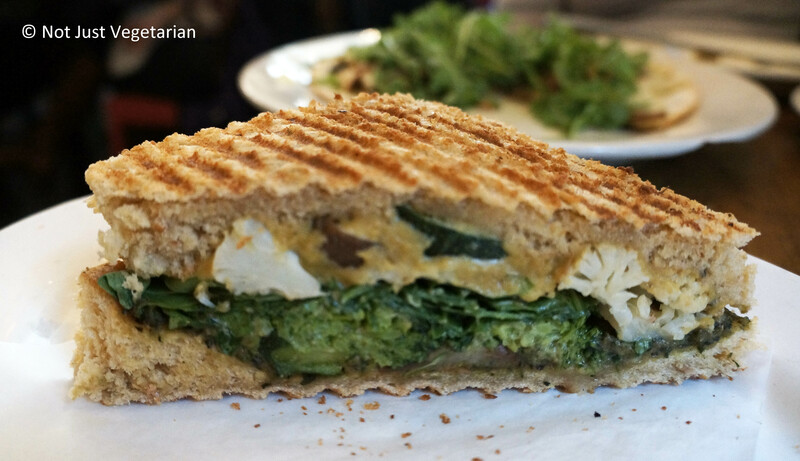 The panini was made with housemade focaccia bread, but had texture different from regular bread. The server mentioned that the focaccia was made without yeast – is that why it was somewhat brittle and crumbly? The oven dried seasonal vegetables were cauliflower, and broccoli. The cashew cheese and the basil spinach pesto slathered, rather generously, on the focaccia made for excellent spreads. Overall, a wonderful panini for lunch. I have never had a roasted potato pizza before. I love roasted potatoes and fried ones too, but have never had them on a pizza. The first time I had heard about potatoes on a pizza was in this video by Mark Bittman of the New York Times showing how to make a white pizza with potatoes and rosemary. 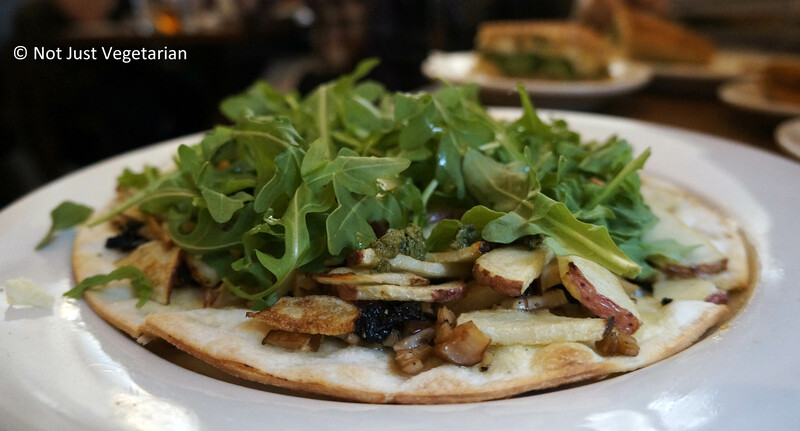 I got the roasted potato pizza – it was on a thin crust, had roasted sliced potatoes, with the red skin on, sautéed mushrooms, black olives cured in oil, some basil pesto, and topped with a lot of fresh arugula – I loved this unique pizza. I would have preferred this pizza with more basil pesto or more cured olives or olive tapenade. This 9 inch pizza could easily be shared by two people. The moment it arrived, I knew that I would have to take some home, and I did take most of it home. I must add that it tasted way better at the cafe, than at home when I had it for dinner – as it is with most things you take home after lunch / dinner at a restaurant. None of the desserts by dessert chef Kristin Kolnacki are made with dairy or eggs or refined sugar. There are a couple of gluten-free cookies available too. 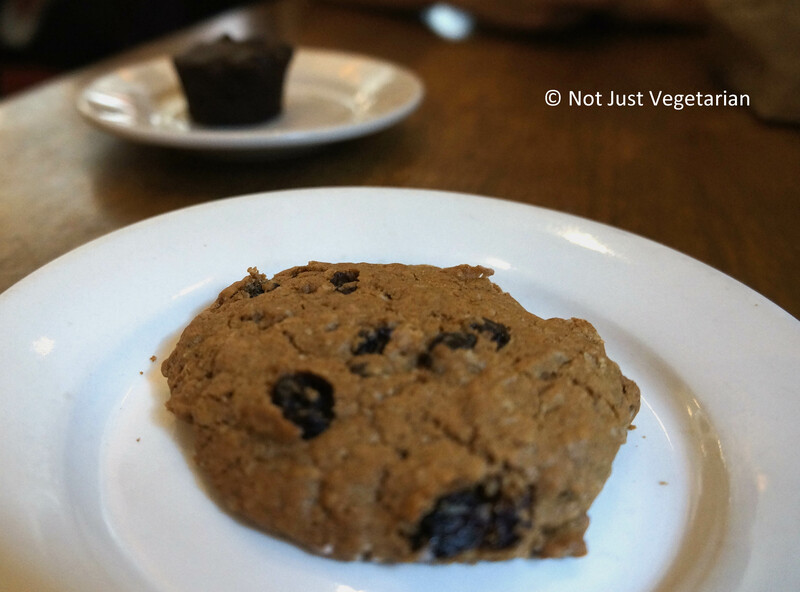 We tried the vegan oatmeal raisin cookie and the mini vegan brownie. The oatmeal raisin cookie tasted like a regular oatmeal raisin cookie, except that it was more brittle and less moist than a regular cookie. 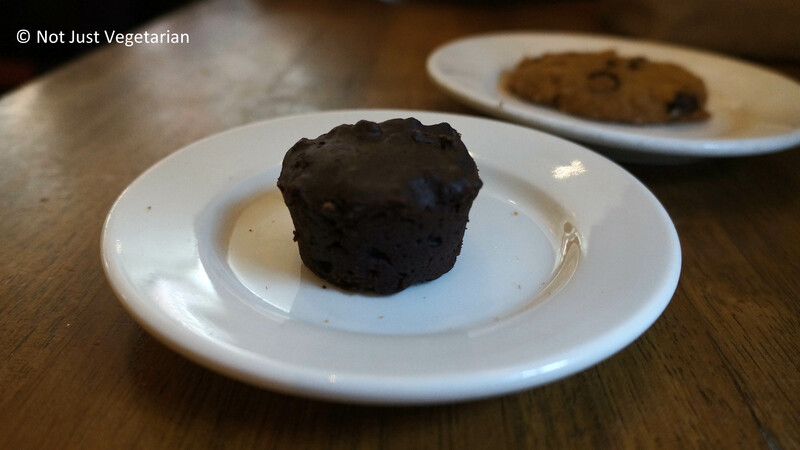 The mini vegan brownie was terrific. It was dense, chocolatey, and not too sweet. Personally, I prefer a regular brownie made with butter and eggs, but for a vegan brownie this was nice. Why would you go to Peacefood cafe? I am definitely going back to Peacefood Cafe to checkout their sandwiches that were best sandwich winners in the 2010 NYC Vegan guide and of course, other vegan dishes on their menu. 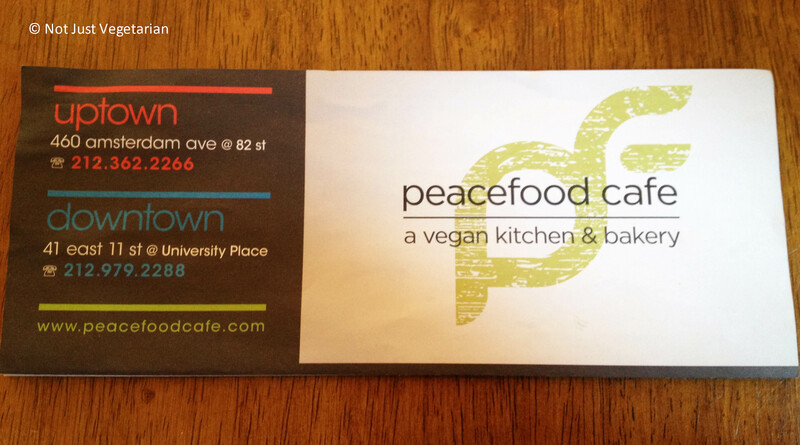 Peacefood Cafe has recently opened a new location on 41 E 11th Street, at University Place in NYC.